Traditionally with ladies antique and vintage jewelry it was worn either around the neck, on the ears and then around the wrist or on the fingers; unlike contemporary jewelry which can also be found in the tongue through the nose and navel, and other more intimate places. Of all the pieces of antique jewelry, a woman would probably say the most important piece of estate jewelry she has is her vintage engagement ring, and this is obviously, because of the special sentimental attachment, and its symbolism of love. However if you remove any emotional attachment to your antique jewelry pieces and just take it on its wear-ability factor; the most important piece of jewelry a lady can wear is her earrings. The reason for this is that when you are talking to someone they are normally looking at your face, and the first piece of jewelry they see are your antique earrings, and they frame the face. 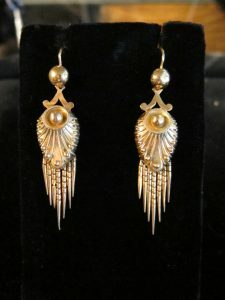 The earliest antique earrings would have required a lady having to have her ear pierced, as it was a period before they had the technology to have spring/clip earring closures, and the earrings were mounted on a wire in the shape of a 'shepherds' hook, which had to go through the ear. 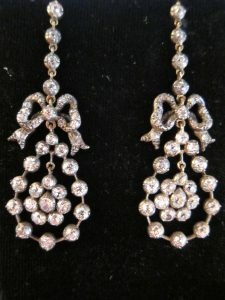 Most Georgian and Victorian earrings were in a drop form and could be over 3.5 inches in length and very often they were articulated, and had movement to them. 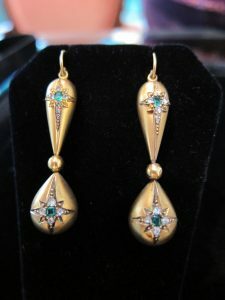 During the day the Victorian lady would wear a gold earring very often set with semi precious stones, but at night Victorian earrings would be a long gold mount with a silver top set with diamonds. The reason for the silver top on the gold, was that Victorian Jewelers, found that diamonds always looked 'more alive', shinier and brighter, with their full adamantine luster shown to the full, when set in alight colored metal.. As this was an age when platinum had only just been discovered in the late 1800's, and the refining process was very expensive, and platinum needed a much higher temperature to fashion it, silver was the metal of choice to set diamonds in. 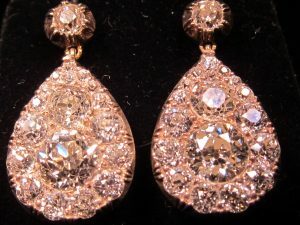 The shape of Georgian and Victorian drop earrings could also vary, with 'chandelier style', 'pear shapes' with a fringe drop, 'hoops' and architectural arcs and dome shapes all being very popular. The other style that was popular, throughout the Georgian, Victorian, Art Deco, Retro, periods, and continues to be popular even in contemporary designs is the cluster form, with a main central stone surrounded by smaller stones. In the earlier periods, many Georgian and Victorian earrings were extremely versatile. During the day a lady would wear the cluster, but at night a drop form would be added, which hung from the cluster, making the earrings day and night. By the Edwardian period of the earlier 1900's fashions had again changed, and due to the first world war ladies were now having to work in the factories, and cover work done by men who were now in the military. 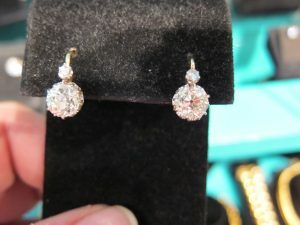 Diamond or precious stone drops, with a 'French' back became very popular, and they were the equivalent of the diamond stud earrings of today. This drop design, normally had a small diamond at the top, and then either a larger diamond or precious gem stone beneath it. The earring went through the ear on a small curved gold wire, and once it was through a spring closure gave the wearer a secure attachment. 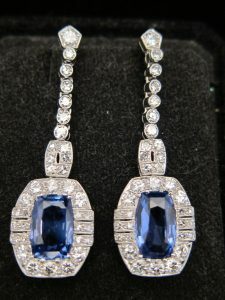 The Art Deco period was a very decadent, ostentatious time period, and the earrings highlighted this style. They were mainly in platinum, and had cascade drops of diamonds and or precious stones, which very much suited many of the shorter hair styles of the period. Ladies could, and did really show off the magnificence of their earrings in the 1920's - 1930. Lastly in this blog we come to the 'Retro' period of the 1940's & 50's where the main shape for earrings was the hoop or disc/dome shape. They also had clip closures, sometimes with a post, for security, but very often the clip was the only closure feature. The reason for this is that ladies, with these 'vintage' clip earrings could move them around the ear lobe, to the most comfortable position, and another advantage of these 'Estate' earrings, was that the clip closure, made it very simple to slip earrings on and off, when the lady was speaking on the telephone. At Beverley R Jewelry, we have all the different styles, from all these different periods. 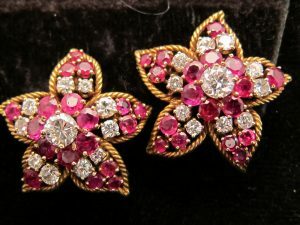 Several of these earrings you can see pictured at the beginning of this blog; and we would very much like you to come to our shop in Walton Place, downtown Chicago, so that you too can be the proud owner of an exquisite pair of fine quality, original earrings, that no one else has.